Aprons aren’t just for the kitchen, although you definitely need them in the kitchen. The right apron can help enhance the look of your servers also while providing them with many functional uses that make the job easier. 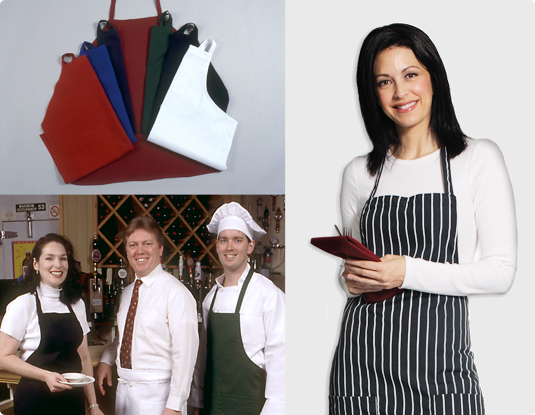 We provide several styles of aprons in a wide variety of colors so you can create just the right look for your servers. You may not realize it, but aprons aren’t just for show. Aprons serve very important functions in both your kitchen and your dining room. First, they protect your employees from spills – often hazardous because of high temperatures. If aprons are part of your restaurant uniform, your staff doesn’t require a complete outfit change when a plate or glass accidentally spills onto their clothes. They can simply change out of the dirty apron and replace it with a fresh one. Aprons also help servers organize in a way that is natural. Aprons are a great place to keep pens and notepads, which would look awkward and take a while to remove from shirt or pant pockets. With pocketed aprons, your servers have everything they need within easy reach so that no customers are left waiting. Finally, aprons look good! They add a touch of professionalism to your food service establishment and are an easy and cost-effective way to promote unity within your restaurant staff. When all is said and done, your primary concern is probably the cost and time spent purchasing and maintaining your restaurant aprons. Let Gold Coast take care of it for you! We provide easy, simple apron rental and laundering services to a wide variety of food service businesses – from small shops to fine dining establishments. We can work with you to find the exact product and service that meets your needs. Contact us today for more information about our high-quality aprons!